Eight years ago this month, I found out I had breast cancer for a second time. In August of 2010, I had the cancer infested breast cut off. I tend to be a minimalist, so I only had the one breast removed. I don’t have any genes that say I’m at genetic risk for breast cancer, and I don’t have a family history of breast cancer. A double mastectomy didn’t call out to me. 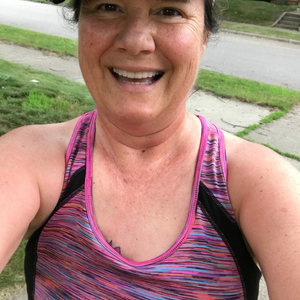 Since the cancer came back as a new cancer in the same breast that had been radiated in 2005 when I did treatments for that first bout of cancer, rebuilding the breast with the thin skin of the radiated breast was going to be super difficult. I opted for no reconstruction. Picture it: one normal breast on the left side of my chest and total flat chest on the right side. On the days that I don’t wear a prosthetic plastic breast plopped into an expensive bra that has pockets for prosthetic breasts, my chest is uneven. It’s easy to write that, it is not easy to live it. For the past eight years, I have struggled MANY, many, many days with the unevenness of my chest. I already wear a continuous glucose monitor device on my body, plus an insulin pump, both of which cause people to notice and wonder. On days when I additionally have an uneven chest, I often feel WEIRD and ODD. Not that weird and odd are bad, just uncomfortable. Intentionally I order cycling jerseys on the big side so that they are baggy on top, so that my uneven chest isn’t so obvious. This is because when I exercise, wearing that plastic breast is just plain old awful. It bounces weird and it gets crazy hot. I opt out of wearing that plastic breast, so as an amateur endurance athlete, I am uneven on top. Luckily I am not a large breasted woman, so my unevenness doesn’t call out too loudly. Right now we are deep into triathlon season, and I am swimming, biking and running with tight clothing. My uneven chest is on full display. So here I am for the first time, writing about it. I know that things become easier when instead of hiding from them, we announce them and process about them and as a result, normalize them. That is happening about diabetes devices. Theresa May, the British Prime Minister, wears her continuous glucose monitor on full view on her arm. And recently there was a new ad put out by American Eagle/Aerie highlighting lots of different bodied models, including one who was wearing an insulin pump and a continuous glucose monitor. Maybe one day one-breastedness will become as normal as being one legged or one armed. In any case, slowly and surely I am getting more confident about my one breasted chest. If you ever see me in tight athletic clothing, it’s a-okay with me if you mention that you notice. Collectively we make it not weird and not odd. If you’re not yet on my email list, please consider signing up. I will keep your name and email private. In case you’re curious what the left side of my chest looks like these days, here it is…. Mari – You are such an inspiration to so many! I know it took courage to write this post, but it is so wonderful to see all the comments and how you have helped so many other people. Thank you for being brave and vulnerable. I’m glad to know such an extraordinary woman. I feel fortunate to know someone as COOL and AMAZING as you!!!! Thank you! Thanks for telling me some of your amazing story!!! And lo and behold one of my teacher friends who is an expert knitter, she’s already knitted a kidney and a uterus, has downloaded the pattern from Knitted Knockers and she’s got yarn and she’s going to knit me a knocker!!!! SUCH AMAZING things happen!! What a great blog and what a great community of support you’ve built. Well done on all counts. I am once again impressed with your leadership. You are moving us all forward toward self-acceptance appreciate all that is good and right in the world. Linda!!!! Thank you!! This blog took some guts to write. Glad I did it!! As a fellow breast cancer survivor who also lives with type 1, I get your statement. Fake chest is harder than fake pancreas. Sending love! Very poignant and honest essay on being one-breasted and diabetic to boot. I was riveted by what you wrote. The picture of your naked torso was beautiful. I couid well imagine your “other breast” still there and thought the tattoo was stunning and oh-so-feminine. Thanks for your kind words!! Glad you liked my post! And I do love the tattoo too! Your picture is beautiful. 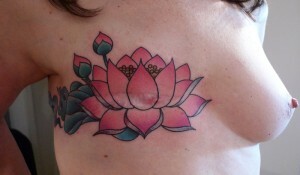 The tattoo is beautiful and, quite frankly, you have a nicely shaped breast to go with it! You are amazing and an inspiration! Heather the awesome Yoga Nerd!! What courage Mary! I wear tight shirts for biking, and I know my cgm and pump pod stick out noticeably. I bike alone in rural areas, and people around here look at guys weirdly if you wear bike shorts anyway. Growing up with a family of jocks, I am old school at the gym locker room, letting it all hang out, so to speak. No attempt to cover anything. That in itself freaks out the younger guys. The pump and cgm just add to the intrigue. There is a guy with a cocklear hearing implant. He makes no effort to cover it up, so it is no big deal. BTW: love, love, love the tatt! I love hearing your story of letting it all hang out!!! And thanks for your kind words about my tat!! I do love it! The first time I ever saw someone with an Omni pod was at a bare buns 5K race at a nudist colony that benefited diabetes research. He was an ultra runner. No idea at that time that I would have one within 5 years. Inspirational story, Mari. Thank you for sharing your story of body-shaming-turned-body-pride. You’re beautiful inside and out! I am profoundly grateful for our friendship and your continued wisdom!! One day I might opt for more ink! You are always an inspiration on that front!!! Thank you for this post! I too am a one breasted woman. I was diagnosed with a rare form of breast cancer at the age of 28 and had a mastectomy at 29. Being so young and a D cup, I did opt for reconstruction and had an implant placed. However since then I have had AND breastfed 3 babies, so my residual breast is not even close to the shape and size of my implant. So I TOTALLY get the unevenness! It’s frustrating to shop for clothes, and especially swimsuits! And yes, the prosthetics are heavy, hot and annoying. Thanks for sharing you experience here! I wish none of us had to go through this, but it’s so nice to know I’m not alone. WOW! Way to go and thank you for sharing a bit of your story too!!! You are one amazing human! Way to go on having three babies! All after breast cancer. The importance of sharing our stories is essential! Knowing we are not alone is key. My only comment is about your wish that one day one-breastedness will become as normal as being one legged or one armed. I hope someday cancer is cured, and we won’t have to worry about this then! Obviously, can’t fix the damage it has already done. Your words are very kind. Thank you. I sure hope someday that both diabetes and cancer are cured. So true, once the damage is done, not much going back. Thanks!! !